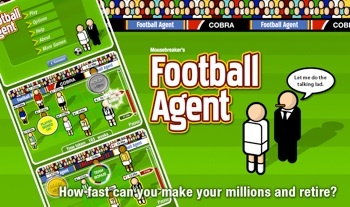 As we edge closer to the 2010 world cup Cobra Mobile release Football Agent for the iPhone and iPod Touch. I myself can’t stand football but luckily this game is more football themed than playing the actual sport. The idea of the game is to buy and sell football players at a profit. So if one football player is being sold for one hundred thousand and you buy him and then he goes up in price to four million and you sell him you have made a profit and you have to keep doing this to rake in a huge amount of money. Restrictions on how long you have to buy and sell players apply. You have 200 weeks which is 200 seconds where you can buy and sell your players. Each time you finish a game your score of how much money you earn gets added to a leader board where you try to beat it next time you play. Adding a degree of replay value and addiction. To make the game more interesting football players occasionally have symbols that appear on them. One is ‘potential trouble’ where the players value can plummet very quickly another is ‘potential super star' where the players value can increase very quickly and one more where it can go either way so you are taking a gamble. The controls are very simple, all you have to do is tap on a player to buy them and tap on them again to sell them. The graphics are simple square cartoony players on a cartoony field. The colours are nice and vivid, but some more work could have gone into buy and sell transitions and maybe some more detail in the animation. The music theme tune that Football Agent has I put up with at first and thought it was somewhat catchy. In the end I disabled it because it's repetitiveness drove me crazy. The sound effects are very simplistic for transitions when you buy and sell players. Overall I would highly recommend Football Agent for those looking to get in the world cup spirit. The game also appealed to me and I found it addictive. So I think it should also appeal to other football hating extremists. After all its only 99c and is the perfect kind of game to play with friends or when you're waiting for something to get done.